Sunpenny Publishing Group: Birthday Blessings! Today I have reached the wise old age of 51 (I must be postitively a sage! 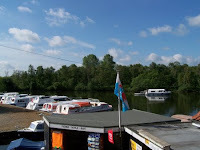 ), and sitting here with my morning coffee I can look out over my balcony and see a gorgeous sunny morning that has spread itself like a blanket of light over the park and water below, and sprinkled itself among the trees that surround Womack Staithe. Pic below taken this morning! For some reason unknown to me, last night I slept 8 hours straight (anyone who knows me well, knows that achieving 4 good hours in a row is about the best it usually gets) - Blessing Number One: I am rested! Knowing that hubby is working in London and therefore is not with me today, my daughter has slathered presents and flowers and messages all over me in the hopes I'll get a birthday tan of happiness (it worked!). 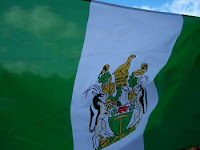 I've had birthday messages from school buddies of loooooong ago, back in Rhodesia ... and my best friend Lucy is driving across from Bunwell to meet me for lunch, which will be taken at the Swan in Horning. (Hello, Christine!) ... and I haven't even had time yet for either breakfast, or for checking out all the e-cards I've been sent. Even CP gave me a birthday voucher of $5 (ooooh!). I'd rather have one from DAZ3D of course, but I don't think they give birthday vouchers! Har! ... and NO SALAD AT ALL! har! No time to blog - judging at full speed!